The repression complex of these cells silences genes related with cell proliferation and death, two key processes in cancer. The discovery contributes new knowledge on gene-silencing mechanisms and will help identify new targets for possible future treatments. Sometimes, the silencing of a gene is as important as its activation. Nonetheless, up to now, most studies on hormone-mediated gene regulation have focused on researching the factors that influence the activation of certain genes. Little attention has been paid to gene silencing. But researchers at the Centre for Genomic Regulation (CRG) have discovered that there is a mechanism of active repression in hormone-dependent breast cancer cells that acts on genes related with cell proliferation and death. “Up to now, the emphasis has focused more on the fact that steroid hormones can augment the activity of certain genes, and little was known about the mechanisms by which these hormones can also repress or silence genes,” says Guillermo Vicent, main author of the study and researcher in the Chromatin and Gene Expression Group led by Dr. Miguel Beato. In a study published in The EMBO Journal, Vicent and his team show that in the cell lines derived from breast cancer, some 1,000 genes are activated by the steroid hormone progesterone, but another 650 are repressed by it. “For the first time, we have described an active repression mechanism involving the progesterone receptor and a repressor complex made up of different proteins, among them the ATPase BRG1, the demethylase KDM1, the histone deacetylases HDAC1/2 and the protein HP1g,” adds the researcher. The study focused on processes that take place in the chromatin, the complex of DNA, histones and other proteins found in the nucleus of our cells. Cells need proteins to perform different functions. These are obtained through the information contained in the genes. Cells must control the expression of the genes through transcription factors in charge of reading and interpreting the instructions contained in the DNA to build proteins. However, this is not a simple process. The DNA is packaged in the chromatin, and to access this information, it has to be modified in different ways. The CRG researchers have identified a protein, called FOXA1, that signals the genes to be repressed to the progesterone receptor. To do so, FOXA1 interacts with BRG1, one of the components of the repressor complex, which compacts the chromatin even further, restricting access to the machinery that transcribes the genes and making it impossible to read them. 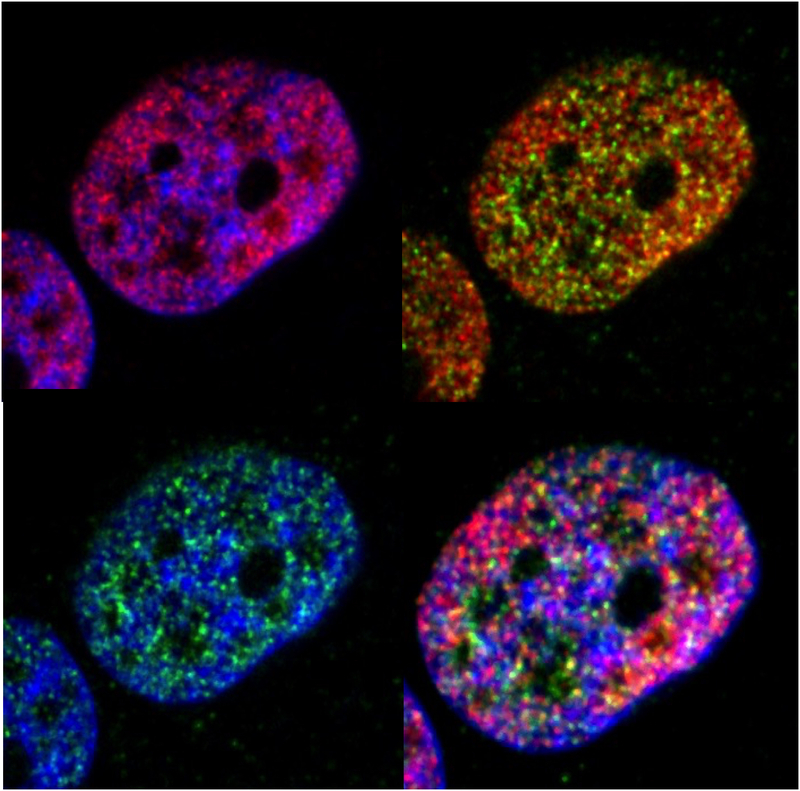 “Interestingly, we have seen that one of the components of the repressor complex also participates during genic activation, but forming part of another complex that has the capacity to remodel chromatin and make it more accessible. On the other hand, when it plays a repression role it does so in a different context and promotes the silencing of other genes, says Vicent, who explains that the silenced genes are involved in cell proliferation and also cell death or apoptosis. “Although our research has been performed with cancer cells in culture, knowing the components involved in the genic silencing process allows us to identify new targets for possible future breast cancer treatment,” says Vicent.